KNOWEB: SKY IS THE LIMIT FOR THIS MAN ! SKY IS THE LIMIT FOR THIS MAN ! Some wise man rightly said this : Don't see first page of newspaper when you wake up in the morning; rather see the last page where sports achievements are covered. If you unfold the meaning hidden in these lines, you find that the first page of any newspaper reports violence, failures, corruption, politics which generally catch anybody's eye. Where as, the last page, mainly stays on Sports, Achievements of individuals, Science, History etc. But exception is everywhere. Sometimes, the front page of a newspaper also reports some inspiring news and that wonder happened this morning when I flipped through the newspaper. 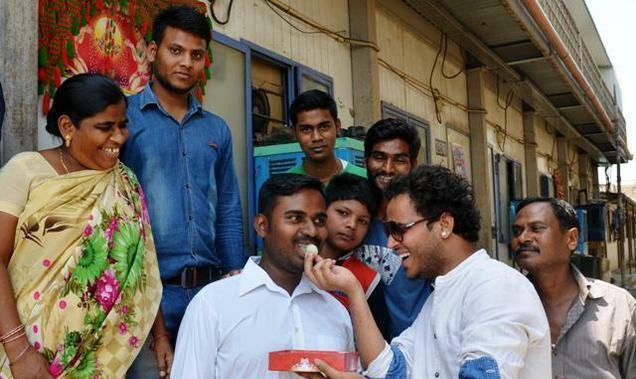 The news is a Dalit man from Delhi's slum area cleared Civil Services Examination this year. In fact Delhi is the hub for Civil Services coaching centres. Thousands of civil services aspirants make Delhi as their home in the process of getting selected. I was told by a friend that Mukherjee Nagar in Delhi is known for so many such unsung heroes who come from different parts of the country specially for coaching and some of them stay in sub-human conditions in the name of preparation for this covetous exam. If we go into the details, Sandeep Kumar who did his BA (Political Science) through correspondence course clinched 780th rank which, he believes would fetch him either IPS (Indian Police Service) or IRS (Indian Revenue Service). The crux of the story is, Sandeep prepared on his own and achieved this feat without any coaching. News reports reveal that this 28 year old son of autorickshaw driver lives in a 10 x 12 feet makeshift cabin at Anand Parbat, a suburb in Delhi, with his family. Sandeep said that for the past two years, he had been putting in 10 to 12 hours of hard work everyday. With this achievement, Sandeep became a overnight celebrity in his colony. He stands as a shining example of what a poor man with a strong resolve could achieve even without any adequate financial background or guidance from coaching institutes or mentors. Though he did not give any direct credit for any person who mentored him to success, I strongly believe that some great books might have triggered him inspiration to tread a path to success. The advantage of book as a mentor helps you to better groom in life in a never-ending process. We are all endowed with this hidden potential. But success embraces only those who believe in themselves and constantly test new waters at every opportune moment !